Even though it is; once again, Imperial Fists as plot device* - it's fiction that involves the Imperial Fists. GO AND READ IT! * Think about it. Usually when Imperial Fists show up in a story, it's to either provide the shining example of Space Marine this-or-that, kill off something, provide a plot hook, or die gloriously to show that the threat is legit. Sometimes all of the above. Are you an author of 40K fiction that's written yourself into a corner? Send in the Imperial Fists! They'll clean it up. No problem. Ultimately this isn't a bad thing ... fans of the Imperial Fists have always known that they were the best chapter ... it's just bad for ever getting a good novel about them written. The first couple paragraphs alone, describing Phalanx, are worth the time it takes to install an ebook reader and download the file. Brother Sergeant Anton Beckenbauer commands the 1st Tactical Squad of the 5th Battle Company, known as Squad Bayern. Members of the squad are marked by the wearing of the "Azure Lozengy" heraldic badge (typically on right knees and left elbows) found on the squad banner. Works in Progress and a Baby! ...so needless to say I've been a bit busy doing fetch and carry for the wife as well as wrangling the 2 year old so that Mom and baby can get caught up on sleep. However, I was working on stuff before we went to the hospital and life went topsy turvy. The Sergeant for my Tactical Squad is coming together. I had to pop his arm off to incorporate the magnetized combi-weapon kit from Chapterhouse Studios. I also was working on filing down a Predator front glacis (also from Chapterhouse) with sandpaper in preparation for my Predator kit. I hope to have finished pictures sometime soon. I would have done beards anyway even without fluffy justification; however, it's always fun when your gut instincts are backed up by fluff. "Aye." Garro studied the other men in the room. "This is Dorn's senior cadre? They seem a sombre lot." "True enough. Even on the best of days, the Imperial Fists are a stiff breed. I remember battles my lads of the Third fought with Efried, my opposite number." He indicated a bearded Astartes in the other group. "Never saw him crack a smile, not once in a year-long campaign." Sometimes it's the little things that takes a "duh!" moment to realize. So after mixing my own custom batch of Reaper Pro-Paint Sunlight Yellow and airbrush medium (in my case "classic blue Windex" in 50:50 for the umpteen billionth time I thought.... there's got to be a better way. Enter 80 cent squeeze bottle from Hobby Lobby. This is a 50ml bottle. I used a graduated cylinder (my wife has some old baby bottles with milliliters marked on them) to measure my ratio (in this case 50:50) and marked 25ml with permanent marker. I then wrapped the bottle in clear packing tape (to protect the marking). Luckily 50ml is the top of the bottle otherwise I would have marked the top of the fill line as well. If you're using 3:2 for a non-thick paint (Reaper Master Series, regular GW or Vallejo... 3 parts paint: 2 parts airbrush medium) I would mark the 30ml line instead. The 50:50 is for thicker paints (Reaper Pro Paint and GW Foundation). Now, when I need to refill my airbrush paint cup, I just squeeze in what I need. Soooooo much easier. Well, this took far longer than I thought it would. I have been gathering ideas for so long I figured it was time I put my paintbrush where my mouth is and do a tank. As mentioned in an earlier blog post, I'm trying to incorporate Empire (from Warhammer Fantasy) into my Imperial Fists for various reasons. I started with a Vindicator because it's the closest thing to an Empire Steam Tank. I used metal bits from the Games Workshop Imperial Fists icons pack. The rest was done with an airbrush and Reaper Master Series Paint. All of the text was done freehand with a Micron technical pen. Obviously that text is an homage to the intricate scrollwork at the bottom of an Empire Steam Tank and the add-ons bring to mind the shields. The font is my attempt at Fraktur (the German font) in freehand. This took 3 evenings to complete. I will most likely add weathering to the tank at some point... but not yet. I want to enjoy it in the "pristine" condition for a while before I gunk it up. The text is from Psalms 25:18 and can be found in an earlier blog post about using Latin for 40K. Vide adflictionem meam et laborem meum; et porta omnia peccata mea. ...That is why we adopted - "
"-why we adopted the Junker model of behaviour." Lexandro did not know the word Junker. So I need to define for myself what exactly this means. As this is a Games Workshop game, I decided that first, I would reference the Empire Army Book. To my mind, the Imperial Fists are the "Empire Knights" of 40K in terms of mood and feel... mainly Reiksguard, and draws upon the Prussian Junkers subculture (or rather British stereotypes of the Junkers subculture) for filling in holes. First of all, any serious study of this topic starts with Bolter and Chainsword's wonderful articles (linked on the menu on the right). There are 2 novels with significant Imperial Fists presence (Space Marine by Ian Watson and Sons of Dorn by Chris Roberson). More fluff is tucked away in many other books, pamphlets, flyers, and White Dwarf articles (like the Index Astartes series). 1 - They duel. This is a highly ritualized non-lethal modification of the Academic Fencing with Schlagers (Akademisches Fechten or more commonly... Mensur). In Ian Watson's Space Marine this was a strange affair that involved blocks that gripped the Marine's feet and the duelists basically swung foils at each other until one of them got a scar. ... rather boring actually. ... not the part where they get the scar (called a Schmiß)... the standing in blocks swinging foils. 2 - The earliest battle honor of the chapter says "Rome" and the city colors of Rome are Red and Yellow. Fans of the Fists should recall that the yellow armor and red chest eagle are the among the few "constants" across several old editions for the chapter's coloration. 3 - They recruited from Earth once upon a time (and had a planet based chapterhouse there... was this in Rome? Who knows). Depending on how old your fluff references are, either the Imperial Palace is in England (over Nottinghamshire) or somewhere in the Himalayas (more recent fluff). Prusse is likely one of the old regions of Jermani on Earth back before the Emperor unified them. Regions mentioned in fluff are: Urash, Urals/Terrawatt, Panpacific Empire, Yndonesic Bloc, Jermani, Gyptus, Merica, Nordafrik Conclaves, Alba, Frac, Nordyc, Britonnica, Europa, Hy Brazil). Those old regions don't really matter in current 40K fluff because of tectonic shift due to the Horus bombings and age Earth looks nothing like it does now. However, they help frame some of the oldest fluff and likely give us insight into the personalities of some of the warriors that were part of the 7th Legion (The Imperial Fists). 4 - They are a Fleet based chapter (well... planetoid based, due to the size of Phalanx), and recruit from all over the Universe now. They maintain a few chapter monasteries on a few specific worlds (Inwit, Necromunda, and others) but the most recent book suggests that when recruits are needed, they just drop onto a world and grab up young teenage boys (14 years old +/- 1 year) and put them through their paces. The survivors become Scouts. 5 - They maintain some kind of presence by the Column of Glory and Pillar of Bone on earth (in my mind, sort of a "second Reclusiam") with a Chaplain there. Likely this outpost provides Terran recruits from time to time (Lysander came to the Chapter in this manner, Shadryss was the Chaplain on Earth that brought him in). It's also likely this is the liason to various Imperial/Ecclesiarchical/Inquisition contacts there on Earth. 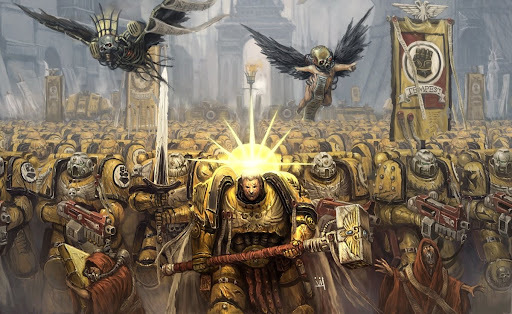 That's speculation, but seems logical due to other fluff that suggests that the Imperial Fists often lead Deathwatch Kill Teams (more, as a percentage, than many other Chapters); that suggests the Chapter has some political clout with the Imperium from somewhere that's over and above what one would expect from them being a first founding Chapter. 6 - The chapter seems to have a pain fetish along the lines of old Christian (especially Catholic) self-mortifcation... flails and cilice belts and whatnot. This fits with my assertion that they're the 40K version of Empire from Warhammer Fantasy. The Warhammer Fantasy army features "Flagellants" that mortify their flesh to show their devotion. 7 - According to Ian Watson (and this may be getting retconned by Black Library as it's barely touched on in the most recent book) the senior members of the chapter tend to compulsively scrimshaw the fingerbones of dead chaptermates. While 40K itself has a strong "bone/ossuary" motif I suspect that this being a psychological compulsion may be removed from the fluff and replaced with a strange chapter quirk. In Space Marine, Watson suggests that the fleshless, cleaned hands of fallen battlebrothers are handed out as laurels and semi-battle honors to survivors of glorious combat actions. These are the fingerbones that get scrimshawed. Since one of the few pieces of Rogal Dorn to be recovered were his hands... this kinda makes sense. I guess. The left hand, the same hand as used on the Chapter symbol, is slighly more significant/more prestigious/higher precedence than the right hand. 1 - My tactical marines are going to have individualized markings on the right kneecap/shin and left elbow cop. This is in honor of the colorful, Landknecht inspired "slashed and puffed" style of the Empire Miniatures from warhammer fantasy. This jives with many other Codex chapter practices of marking Tactical squad affiliation with kneecaps and the like. It's also subtle. I have no desire to put frilly cloth and floppy hats and feathers on my Space Marines. 2 - Sergeant and Officer Banners will be painted in honor of provinces, city-states, and noble families of Germany - like the Empire Regiments and their many colorful provincial flags. 3 - Depending on availability and my skill at converting, my officers will have facial hair. The "bald head" works great most of the time, however nothing screams "Empire" more than a dashing, suitably "Germanic" beard. 4 - I have a shoulder pauldron with a wing available from both Chapter House Studios as well as Games Workshop itself (the Fists command sprue). This looks very much like the old shoulder guards from Warhammer Fantasy knights. I plan to use this more often. See Sergeant above. 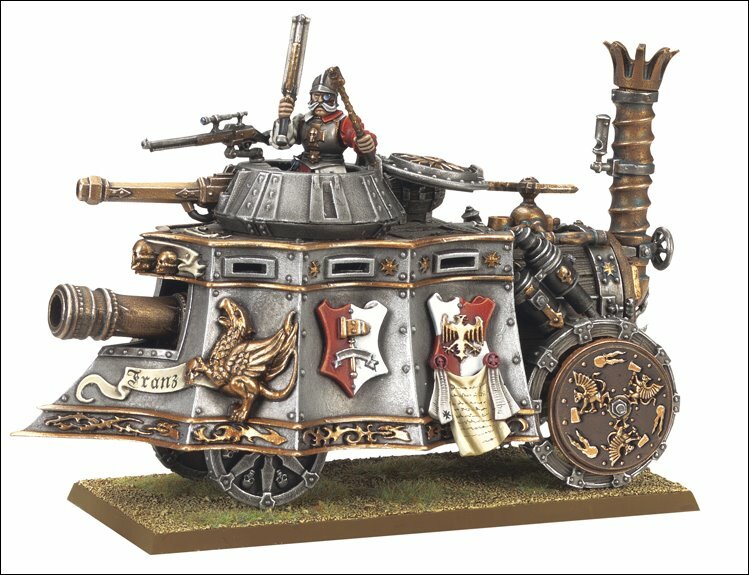 5 - Vehicles will have "trim" - after studying the Empire Steam Tank model kit, I plan on painting freehand scrollwork along the bottoms of my vehicles and add lots of decoration. ... in part 2 of this, I will spend more time studying the Prussian Junkers system and see how that will affect my fluff and backstory. Here's the Multi-Melta trooper from Tactical Squad Bayern. I painted him during Labor Day. I purchased several GW Crimson Fists Command packs, and this is my first figure using the bitz from it. The power fist came from a Devastator box set. The base is from Dragon Forge's Urban Rubble Wasteland set. This will be Sergeant Anton Beckenbauer that commands Tactical Squad Bayern (5th Battle Company).